attempt to offload the predicate conditions into the cells. If the smart scan was not used, then predicate offloading did not happen either (as the filter predicate offloading is part of smart scan). 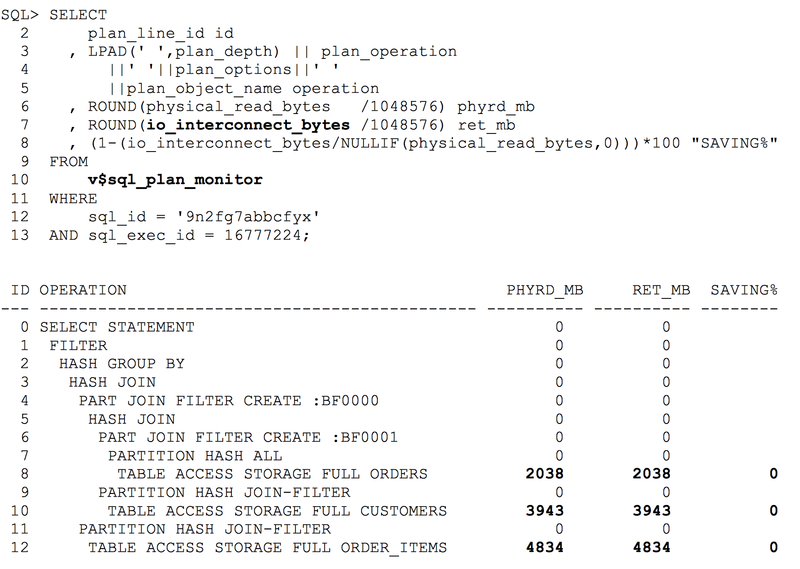 The key thing to remember is that Exadata smart scan is not only a property of an execution plan – it’s actually a runtime decision done separately for each table/index/partition segment accessed with a full scan. It is not possible to determine whether a smart scan happened just by looking into the execution plan, you should measure execution metrics from V$SQL or V$SESSION to be sure. It is also possible that a smart scan is attempted against a segment, but during the smart scan execution, the cells have to fall back to regular block IO mode for some blocks and ship the blocks back to database for processing – instead of extracting rows from them inside the cell. For example, this happens for blocks for which the consistent reads require access to undo data or there are chained rows in a block. There are more reasons and we explain these in detail in the upcoming Expert Oracle Exadata book. This should also explain why is there a filter predicate (executed in the database layer) in addition to every storage predicate in the plan, because sometimes the filtering cannot be entirely offloaded to the storage cells and the database layer has to perform the final filtering. Let’s look into an example query now, executed in serial mode at first. Basically it’s returning all customers who have ever made orders where the total order amount exceeds their customer-specific credit limit. All the tables are partitioned and their total size is around 11GB. 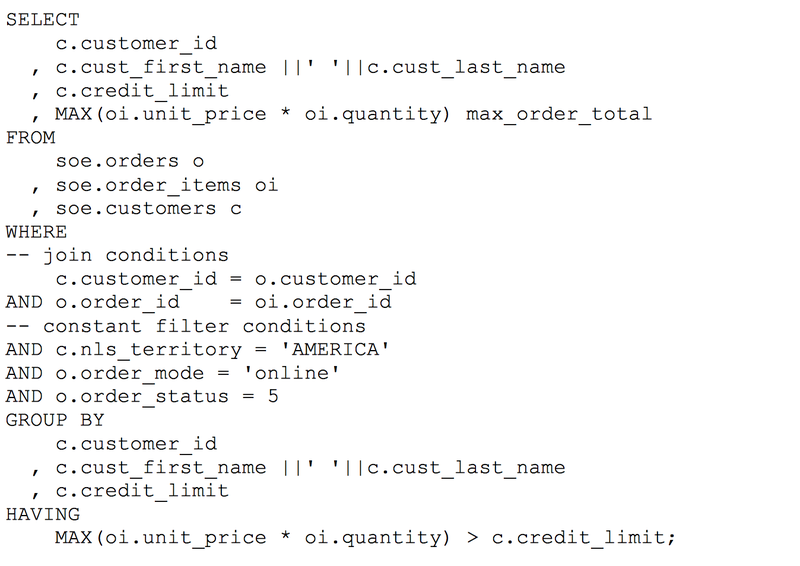 Note that this query is written against a regular normalized OLTP-style schema, not a star- or snowflake schema which is you are likely using in your DW databases. But for purpose of this demo it should be enough. When executed on an otherwise idle quarter rack Exadata V2 installation, it took 151 seconds to run, which seems too much, knowing that the smart scans on even a quarter rack can scan data on hard disks multiple gigabytes per second (and even faster from flash cache). 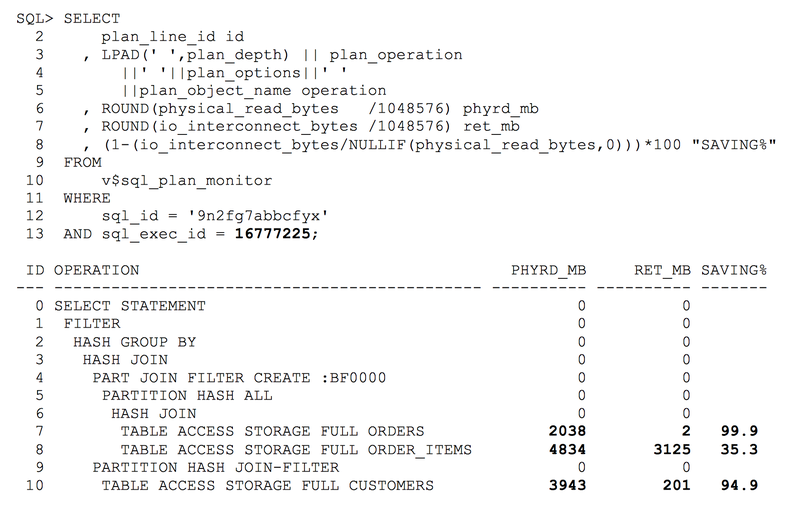 The physical_read_bytes metric (phyrd_mb) shows that Oracle database layer has issued 10833 MB worth of IO calls for this SQL. And the io_interconnect_bytes (ret_mb) shows that this query has also used 10833 MB worth of IO interconnect traffic (between database host and storage cells). So, the smart scans were not able to reduce the cell-database IO traffic at all. In fact, when looking into io_cell_offload_eligible_bytes (elig_mb), it’s zero. This means that the database has not even tried to do smart scan offloading for this statement. If 10GB worth of segments would be read via smart scans, then the “eligible bytes for offload” would also show 10GB. So, this io_cell_offload_eligible_bytes metric is a key for determining whether any offloading has been attempted for a query. Note that V$SQL accumulates statistics over multiple executions of the same query, so if this cursor has already been executed before (and is still in cache) you should not look into the absolute values in the V$SQL columns, but rather by how much they increase (calculate deltas from before- and after-test values). Indeed we aren’t seeing the cell smart table scan (or cell smart index scan) wait events, but a cell multiblock physical read wait event as the top one – which shows that half of the query time is spent doing regular multiblock IOs from storage to database. Note that there’s still a chance that smart scans are happening for some tables involved in the query (but they don’t show up in the top waits thanks to their fast, asynchronous nature), but the regular multiblock reads show up thanks to rest of the tables not using smart scan. Luckily it’s possible to check exactly which execution plan row sources do use the smart scan and how much do they benefit from it. The V$SQL_PLAN_MONITOR doesn’t have the io_offload_eligible_bytes column showing how many bytes worth of segments were scanned using smart scans, but nevertheless the io_interconnect_bytes column tells us how many bytes of IO traffic between the database host and cells were done for the given access path. In the above example, exactly the same amount of data was returned by cells (RET_MB) as requested by database (PHYRD_MB), so there was no interconnect traffic saving at all. When these numbers exactly match, this is a good indication that no offloading was performed (as all the IO requested by database was returned in untouched blocks to the database and no data reduction due to filtering and projection offloading was performed in the cells). So, this is additional confirmation that none of the tables were scanned with smart scan. which should be scanned using regular buffered reads as opposed to direct path reads, which are a pre-requisite for smart scans. Note that the above query was executed in serial mode, not parallel. Starting from Oracle 11g, Oracle can decide to use direct path reads (and as a result smart scans) even for serial sessions. The direct path read decision is done during runtime, separately for each table/index/partition segment accessed – and it’s dependent on how many blocks this segment has under its HWM and what’s the buffer cache size etc. So, you might encounter such an issue of Oracle deciding to not use direct path reads (and thus smart scan) in real life too – and as it’s an automatic decision, it may change unexpectedly. Let’s run the same query without my trick to disable smart scans, I’m using default session parameters now. The query, still executed in serial, tool 26 seconds (as opposed to 151 seconds previously). The wait profile looks different, the cell smart table scan wait is present and there are no regular block IO related waits. The CPU usage percentage is higher, but remember that this query completed over 5 times faster than previously. Higher CPU usage with lower response time is a good thing, as high CPU usage means that your query spent less time waiting instead of working and wasn’t throttled by IO and other issues. For simple enough queries you might actually see that only a couple of percent of response time is spent waiting for smart scans and all the rest is CPU usage. This happens thanks to the asynchronous nature of smart scans, where cells work for the database sessions independently and may be able to constantly have some data ready for the DB session to consume. Apparently all the physical IOs requested were requested using the smart scanning method, as ELIG_MB is the same as PHYRD_MB. Apparently some filtering and projection was done in the cell as the interconnect traffic (RET_MB) of that statement is about 69.2% less than the scanned segments sizes on disk. The above output clearly shows that the ORDERS and CUSTOMERS tables benefit from smart scan the most. Note that the execution plan join order has changed too, this is thanks to the automatic cursor re-optimization using cardinality feedback from previous child cursor’s execution statistics. In order to get the most out of your Exadata performance for your DW application, you’ll have to use smart scans. Otherwise you won’t be able to take advantage of the cells computing power and its IO reduction features. Full segment scans (like full table/partition scans and fast full index scans) are a pre-requisite for smart scans. Additionally, direct path reads have to be used in order to the smart scans to kick in. For serial sessions, the direct path read decision is done based on the scanned segment size, buffer cache size and some other factors. For parallel execution, direct path access is always used for full scans, unless you use the new parallel_degree_policy = AUTO feature, in which case the decision would again be dynamic.